BEIRUT, LEBANON (7:40 P.M.) – Several corpses belonging to the jihadist rebels were left behind enemy lines on Sunday after their failed attack against the Syrian Arab Army (SAA) troops in northern Hama. According to a report from the Syrian Ministry of Defense, the Syrian Arab Army foiled a heavy attack that was launched by the jihadist group Tanzim Ansar Al-Tawheed on the Massasneh axis of northern Hama. The report said more than 20 members of Tanzim Ansar Al-Tawheed were killed during the battle, including a number of foreign combatants. However, the battle in northern Hama would also be incredibly costly for the Syrian Army, as they suffered over 20 casualties themselves last night. Below is a video that was released on Sunday that shows the aftermath of the jihadist attack on the Syrian Arab Army’s positions in Massasneh. Very strange bullpup riffle at 0:30. Looks a lot like Ukrainian “Vepr” or K-Var AKU-94 but differs, you also have East-Germany MPi-KMS-72 (AK-copy), Czech RPG-75, Chinese Type 69 RPG, many DIY silencers. There is also AKM and AK-74, but was it necessary to say this? 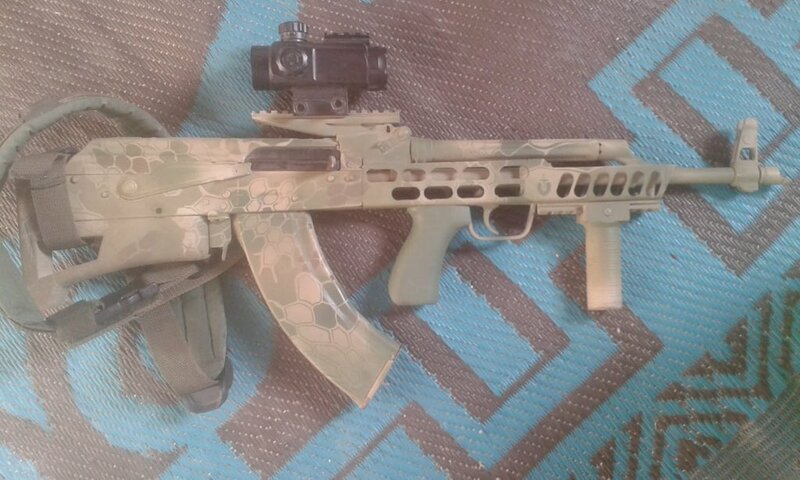 I have no idea where the AKM-bullpup comes from : never seen this conversion kit. Custom job from a gunsmith?